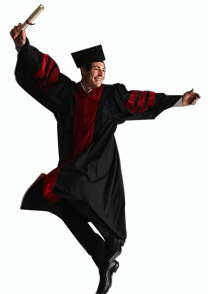 Wholesale graduation regalia & academic regalia wholesale. Manufacturer of wholesale graduation and academic regalia. Our regalia division specializes in the high quality private label manufacturing of wholesale graduation gowns, graduation caps and apparel. We manufacture exclusively for manufacturers, wholesalers, and volume importers. Manufacturing quality wholesale graduation gowns, caps and regalia. We produce wholesale academic apparel including academic robes & faculty gowns, to the custom specifications of our clients, in our own China based manufacturing facilities. We can also make choir gowns, church apparel and legal robes. 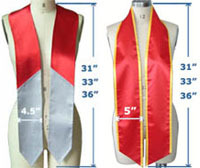 Specialized in plain, printed & embroidered wholesale graduation stoles. Offering volume production capacity but also maintaining the flexibility of fast, high quality 'small wholesale' orders of custom Greek, fraternity, sorority and honor stoles. We supply shops who sell graduation stoles retail. In conjunction with our custom awards division, we can produce custom made graduation medals, year dates for tassels and other premium items from cast metals and various finishing processes.